A very memorable book. I've been trying to summarize it in my head, and that's all I've come up with. Very, very memorable. 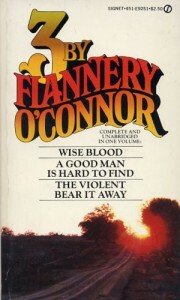 When I started reading Wise Blood, the first of three books in one, I didn't like. I was just feeling stubborn though, so I set myself to reading a chapter at a time. By the end of the story, I was starting to pick it up voluntarily. But I still didn't like it. Moving through A Good Man Is Hard To Find, I sometimes read more than one story at a sitting- but I still didn't like it. Today I huddled up on the couch and read The Violent Bear It Away in one sitting. And I still don't like it. This wasn't an easy book to read. Wise Blood made my skin crawl. I was reading through A Good Man Is Hard To Find with physical revulsion and fear, dreading the sting in the tail of each story. The Violent Bear It Away I read in one sitting, because it had me mesmerized. In the original sense of the word. As in, "the snake mesmerized the small bird before it devoured it alive." It wasn't a pleasant read, at all.